Your valuables will be more secure in a wall safe at home or in an office. 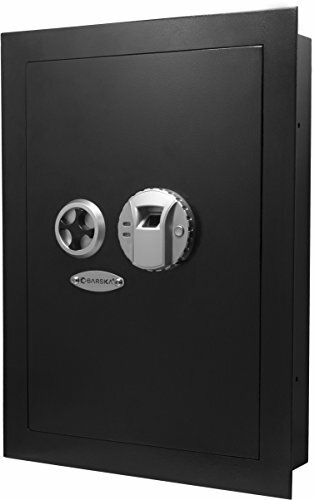 There is a wide choice of safes to protect your jewelry, money, guns and other expensive things from thieves. A plethora of options will allow you to select the most suitable wall safe that does not attract unnecessary attention or is totally unrecognizable. Read these 10 product reviews to choose the safe that will perfectly meet your specific needs. An upgraded version of the Paragon 7700 model with a secure electronic locking mechanism. Its weight is 37 pounds, its door is thick (about 0.2 inches). 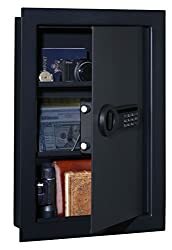 The safe contains 2 shelves, it is around 3.75 inches deep, however, please take into account that the locking mechanism is nearly 2 inches in depth, being almost as wide and tall as the space between the two shelves. Therefore, it is not actually a very deep wall safe. The free space you can use is approximately 1.75 inches in depth, 7.25 inches high, and about 14 inches wide. Despite the lack of room, the consumers consider this safe to be probably the best-hidden wall safe and worth every dollar spent on it. The fact is, neither a grinder nor a hammer nor a drill can destroy this safe or even get into it! 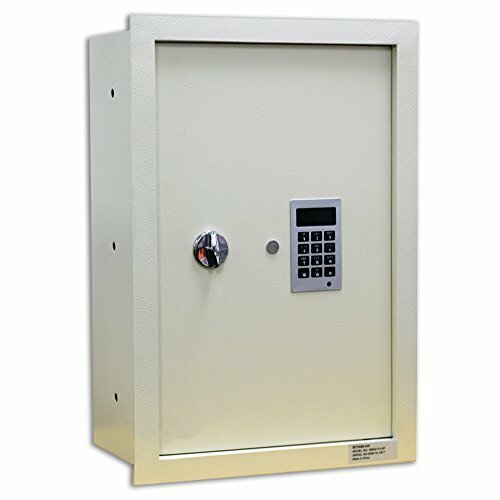 A great wall safe for a reasonable price that has a keypad with a 6-8-digit code and 2 bolts made of metal. It is powered by 4 AA Batteries, and you should choose Lithium Batteries, as they last much longer than regular alkaline batteries. The safe can be also opened with keys if the batteries run down. The keys are well-hidden and have tumblers on both sides for additional security. 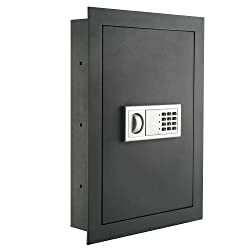 It is a perfect choice among residential wall safes. You can hide it behind a mirror or a picture with a wooden frame. If you are looking for an electronic wall safe, this model will best suit your needs. 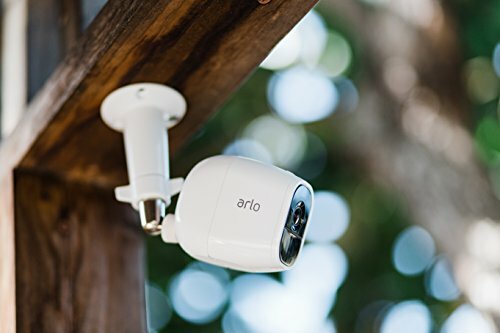 Its locking mechanism is flat and with an easy to hide program to operate, which makes it perfect for your home or office. 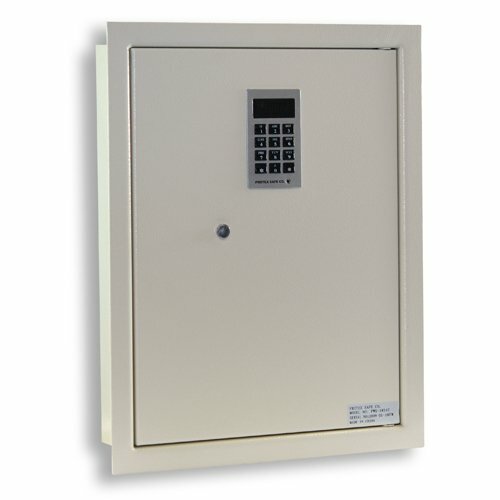 The safe offers 2 options to open, code or key. You can place it behind a picture or inside a closet. The frame around its front part conceals the lines which are not cut straight along the drywall. 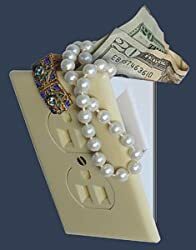 Protex Electronic Wall Safe will provide a great storage for your jewelry, cash, important papers, pistol, passports, and credit cards. 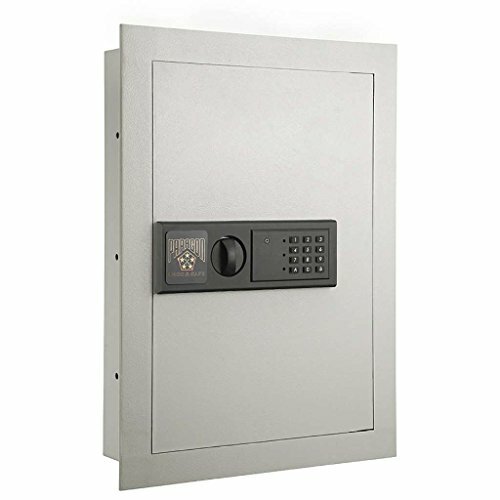 It has a heavy construction, not letting the burglars into it for a long time, a good quality keypad, nice cabinet illumination, and emergency override keys. This safe will also be a nice bonus feature if you decide to sell your house. This biometric wall safe will make your life easier, as there will be no lost or misplaced keys any more. However, it has an emergency hidden lock with a key, in case the batteries run out of energy. There is an external battery pack that will power the unit to open with a fingerprint. Programming is simple, nevertheless, it is better to enroll as many fingers as possible. 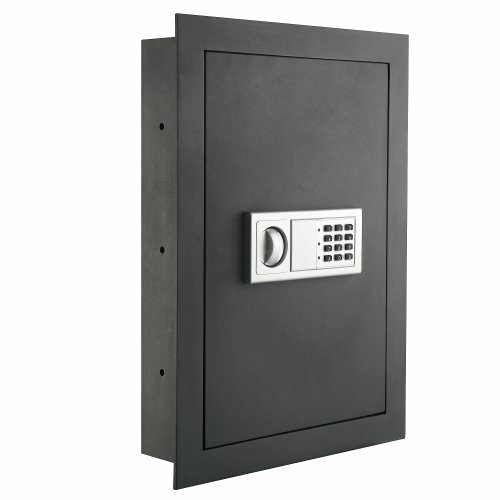 The safe has a stylish design and a nice finish. This is probably the best product among fireproof wall safes between studs (should be installed between 16″ O/C wall studs). It has a reliable electronic lock and will make sure that your valuables will always be protected, even in case of fire. There is a heavy duty 3/16″ solid door and flange made of steel. 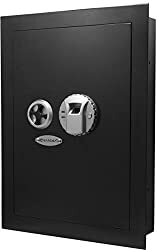 Those who live in apartments or condos will find it the best fireproof safe for cash, as it is well-protected from burglary. This is a great wall safe with a quick access feature to keep your guns secure and away from children. It is quite spacious, so you can bolt it down easily and store a pistol and some ammo on the shelf above and a shotgun with ammo around it in the bottom part, or place 4 large guns there instead. This rifle wall safe is rather heavy (65 pounds), but it looks pretty good. 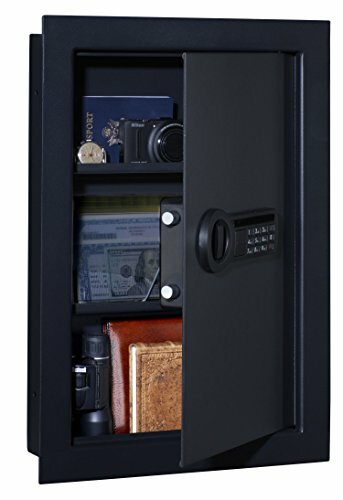 If you are looking for a small wall safe, the Patrol Hidden Wall Safe will be just right for you. It is very tiny and looks like an electrical outlet. The package includes the safe, a cover plate, a small blade, a template, and a key. You can install it easily in just a few minutes using the blade, or a small keyhole saw and cut a hole in the drywall to match the template. The cover and the lock on it are made of plastic, so you should treat them gently. To open the safe, turn the latch with the key and remove the cover plate. It has a hole where you can plug something in, if you want to hide your tiny valuables. 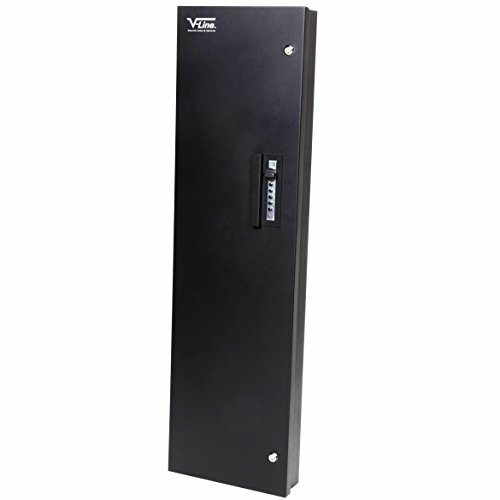 This long gun wall safe will satisfy even the most demanding customer, as it is done very well and can boast of being high quality. The safe has an internal locking mechanism, which is very secure, but somewhat limits the ability to hold multiple firearms inside. In fact, you can freely place no more than 2 large guns there. 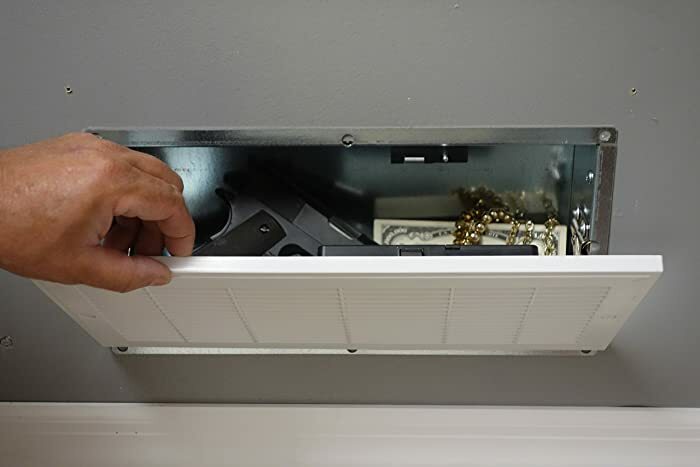 This in-wall gun safe perfectly conceals behind a door. 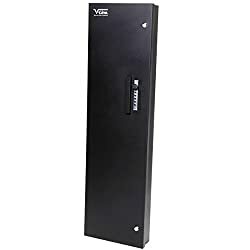 It is a quick-access wall mounted gun safe with a mechanical lock that will deter all but the more skilled and determined thieves. You can choose a front and top opening and either mount it upright or hang it on a wall or door. Placing it vertically on the wall is really simple, as it has pre-punched holes for easy mounting. 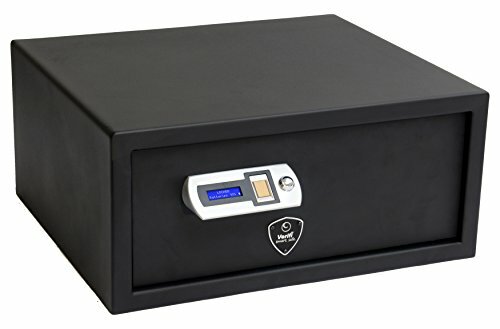 This safe can accommodate a couple of rifles and a handgun or two, depending on their size. It also meets child safety concerns. So, now you are aware of the most popular options and are fully armed to choose the safe which will protect your valuables best of all. You can also read our review of best fireproof money bag. Secure your belongings at home and never leave burglars any chance.